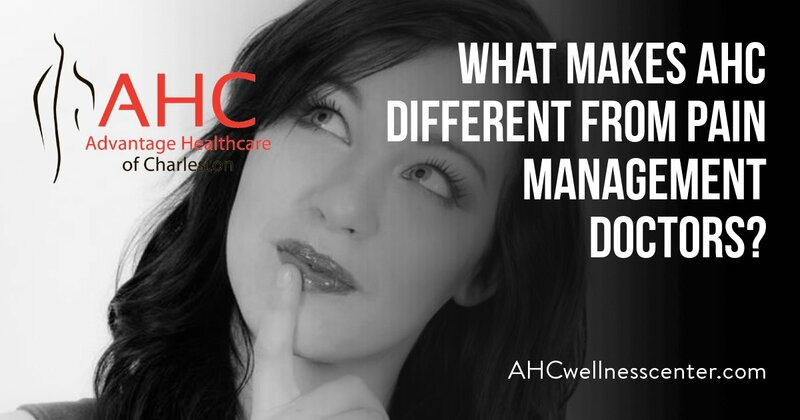 What Makes AHC Different from Pain Management Doctors? Physical medicine offers medical pain relief without medication. Most pain management doctors use prescription pain killers, steroids and powerful nonsteroidal anti-inflammatory drugs (NSAID’s) for medical pain relief. Physical medicine takes a vastly different approach. For instance, when a patient comes to us seeking knee pain relief, we explore treatments such as physical therapy, hydrotherapy, myofascial release, platelet rich plasma and joint injections. In contrast, Pain management doctors often prescribe prescription medications that can have both short and long-term contraindications. In addition to medical pain relief options, physical medicine also explores lifestyle changes. For instance, weight loss may be recommended as part of an overall knee pain relief treatment plan. Or, in some cases, dietary adjustments may help a patient with chronic headaches. Stretching and pre-workout routines may be recommended for athletes who suffer from muscle strains and pain. Pain management doctors focus more on immediate pain relief, where as physical medicine practitioners take an approach designed to help alleviate pain now and prevent pain in the future. When a patient seeks medical pain relief, physical medicine practitioners conduct a thorough evaluation of the underlying cause. In many cases, pain management doctors provide medication to mask the pain, but don’t develop a comprehensive treatment plan to address the root issue(s). For example, when evaluating a patient for knee pain relief, we ask questions, conduct testing and gather specifics that help cue us in to the root cause(s) of pain. We can then not only treat the pain, but also the underlying cause(s). Are you seeking medical pain relief for either an acute or chronic pain? If so, give us a call to schedule your personalized evaluation today. https://ahcwellnesscenter.com/wp-content/uploads/2018/09/What-Makes-AHC-Different-from-Pain-Management-Doctors.jpg 630 1200 Sandy Meier /wp-content/uploads/2018/02/logo-ahcwellnesscenter-Custom.png Sandy Meier2018-09-08 21:31:422019-02-12 01:04:52What Makes AHC Different from Pain Management Doctors? Free Backpack Check – Protect the Back What Are Some Benefits of Trigger Point Therapy?